How Legit Is the Auto Trader? Forex inControl has come up with what they refer to as a new and improved forex robot, the Forex inControl Reborn. The primary difference between the new and the original automated traders is the newly-designed accelerator mode. According to the trading system’s website, the improved trader is expected to meet and surpass the profitability and reliability level set by its predecessor and is made available to a trader after payment of a lifetime fee of $270. How does Forex inControl Reborn work? According to the Forex inControl Reborn website, the advanced automated trader is specially designed to ‘maximize reliability and profitability.’ Its developers base this argument as the reasoning behind the capping of the number of currency pairs the system can execute at any given time to two: AUD/USD and EUR/GBP. The developers also argue that by activating the accelerator mode, clients stand to gain more profit even when using similar settings used with its original version. It also features several other interesting trading tools like the hard drawdown meant to keep the trader’s deposits intact by shielding them from unexpected and unsustainable losses. But how relevant are these claims and assertions and are they verifiable through backtesting or from the trader’s real trading history in Myfxbook? On the automated trader’s website is a string of screenshots illustrating the effectiveness of both versions of the automated trader: with and without the accelerator. According to the website, the AUD/USD backtest was conducted over 4 years. The test took into account tick data with a modeling quality of 90%, an initial deposit of $10,000, over 30-min timeframes and a hard-coded stop loss level of 28pips. The original automated trader is then said to have reported a profit of $24, 437. Its advanced counterpart with an activated accelerator, on the other hand, posted profits in excess of $759,000 over the same period and using the same trade settings. However, while all this talk of the accelerated trader may sound quite impressive, the system developers are using screenshots and data from own website to promote its efficiency. This makes them unreliable as a basis of making the decision to buy subscribe to the trading system or not. In such a case, the Myfxbook trading history account maintained by Forex inControl Reborn becomes the most viable option of evaluating the efficiency and profitability of the system. Here, a $1,000 account created in February 2018 has cumulatively gained 317% with a maximum drawdown of 18%. This translates to an average of 0.36% and 11.25% daily and monthly gain respectively. While these positive results may be appealing, they don’t measure up to what Forex inControl Reborn has been advertising. Most automated traders operating under the same settings have reported higher earnings and even more appealing monthly percentage win rates. One, therefore, can’t help but question the effectiveness of what the developers consider ‘new and improved’ trading system. Forex inControl Reborn trading system may not have lived to most of our expectations but it sure does protect client deposits. Unlike most automated traders currently available that still employ the martingale style of trading that has little regard for stop-loss levels, this trader has a “hard control of drawdown.” A trader can therefore manually decide on the most tolerable risk (stop loss level) before entering a trade. The algorithmic trader’s website mentions that Forex inControl Reborn doesn’t operate full time. 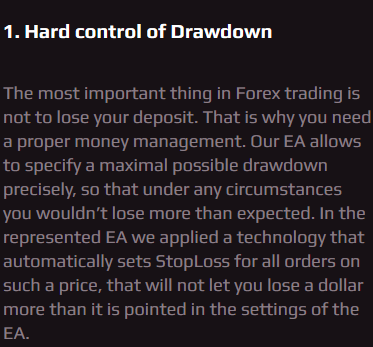 This implies that the EA can be used alongside other automated traders without the risk of compounding an account’s drawdown. What do you need to know before committing? The last thing any investor will do is place the fate of their entire life savings at the feet of a total stranger. Forex inControl Reborn founder’s decision to maintain anonymity, therefore, raises a lot of questions about their self-proclaimed industry experience and expertise as well as the legitimacy of their trading system. According to the trading system’s website, Forex inControl Reborn is well adapted to trade multiple currencies. Its developers have however decided to limit this trades to “two of the best ones.” On one hand, such a move can be hailed as it shows the level of thoughtfulness and testing efforts these developers put into identifying the two trades with the highest potential. On the other hand, however, it may be interpreted as an unnecessary limit to the level of diversification a trader would like to engage in. This beats the profit diversification claim that the auto trader has popularized as the key pillars to the profitability of the system. Forex inControl Reborn has a 30-day refund policy, no questions asked if a trader feels like a system doesn’t perform as well as it should. The also promises to initiate an automatic refund should your account’s drawdown fall below the 40% threshold in the first month of operation while trading on the developer’s recommended settings. 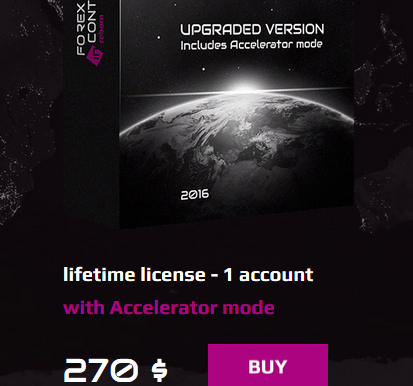 Going through the forex robot website, especially over the accelerator mode and backtesting sessions, you can tell that the system developers are quite sure of themselves. With such confidence in regards to the system eventually beating the market, with incredulous margins, you have to take a step back and wonder why they haven’t introduced the more lucrative PAMM accounts. Forex inControl Reborn has both advantages and red flags in equal measure. Before spending $270 on the lifetime access license with the accelerator, it is important you stop and evaluate both its merits and demerits. However, given the relative positive returns posted by the system and relative stability guaranteed by the all-important hard drawdown setting, we would award the system an overall score of 7.5 out of 10.